When the client calls us for a Mold Inspection in Toronto, Mississauga or GTA area. They have some mold related concerns or areas of concern in the building that they would like us to address, we also attempt to determine if they are experiencing mold related health issues and the length of time mold has been an issue. A brief history of the problem, the source of the problem if known. Have there been incidences of water intrusion/damage, high humidity, flooding, or renovations? Mold spores need water to grow and any past history of water intrusion or humidity may point to areas of concern for the investigator. In a typical basement the location of the indoor problem usually leads us to the water infiltration problem outdoors. Outdoor problems are typically degraded caulking, failing foundation waterproofing, grading and drainage issues. In the attic we typically look for poor insulation, poor ventilation, disconnected bathroom vents and leaking roof. After the Mold Inspection of the building, the mold inspector determines the extent of mold damage indoors and comes up with a method of safe mold removal. Should any visible mold be found, you will be informed immediately. Should toxic molds, such as Stachybotrys, be suspected, you will be notified and an immediate course of action will be outlined. In some cases, no mold is found nor suspected. In other situations in which there are strong indicators that mold exists but is not visible or detectable without intrusive investigation, tape lift sampling of a suspicious area and we may perform an indoor air quality test to confirm mold presence. The mold industry is unregulated in Ontario so anyone can be a mold inspector and more are coming out of the woodwork every day. You as the consumer don’t know if the mold inspector in your home used to work at the Local Coffee Franchise or was a corporate layoff that needed to find work. When I went to school for Home Inspection and later Mold Inspection only four of us out of thirty had a background in construction. There were truck drivers, electricians, sales people, retired and yes there were Local Coffee Franchise employees too. Let’s have a look at the different types of mold inspectors, by my count seven. The home inspector already inspects homes so why not call them for a mold inspection. During the home inspectors evaluation of your home their SOP (standards of practice) does not allow them to call out mold. This is to protect them from possible liabilities associated with a bad call based on lack of knowledge so they say something like a discoloration on the substrate (drywall). Home Inspectors are usually affiliated with a national association that ensures that the quality of inspection you are receiving is up to the standards set by the association. The association also guides the inspectors to squeeze as many dollars possible out of every inspection such as more money for larger homes, extra to thermal image the home, perform lead testing, radon testing, water testing, air quality testing and yes mold testing. The association setup some online courses that the home inspector can take and presto instant mold inspector. The Bottom Line, they may be able to point and say “that’s mold” but how it got there, how to fix it and what to do next are not coming from someone qualified. Both the industrial hygienists and environmental engineers typically work for large environmental firms whose primary income is soil sampling and substance reports. They look at indoor mold problems from a scientific perspective. 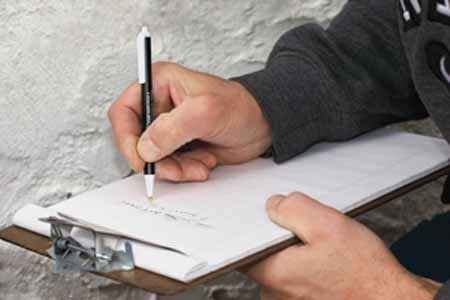 Showing up at your door as mold inspectors they are typically only trained to take surface and bulk samples of visible mold and perform air testing. The samples are taken to a laboratory for analysis and in most cases this testing is unnecessary and not recommended when you have visible mold growth. As the public becomes educated, confused and over informed with mold and the concerns surrounding indoor mold growth many hygienists and engineers look forward to the increase in business through lab sampling. The Bottom Line, offering lab sampling is usually a waste of time and money and can add to the confusion. The corporate layoff or the Local Coffee Franchise employee that overheard the word mold and looked it up on Google only to find someone offering mold inspection training. The course booklets are mailed to you, the courses are technical and the student comes away with mold facts and figures as a piece of the puzzle. I have taken these courses and can spout off facts and figures about mold all day long. The student armed with a certificate but no practical experience becomes a Mold Inspector. The Bottom Line, every time they enter someone’s home they are learning and depending on the quality of their experiences may be giving bad advice. The restoration guy, the word restoration means to restore. Some restorators offer sampling which we read about above and has little to do with the inspection of mold. Most restoration companies started as asbestos and lead paint removal companies and already have the specialized equipment which is also used to remove mold. Unlike asbestos and lead paint, mold will return if not properly remediated and the causes found then dealt with. The restoration guy might have some knowledge of mold, the reason for the mold and the source of moisture are not his problem. They want source removal projects from the mold inspection. Source removal is the complete removal of the mold affected areas (drywall). In most cases the mold is surface mold from high humidity and requires cleaning and repainting, removal is unnecessary. The Bottom Line, The goal of the Restoration guy is the larger remediation project and is rarely there to help, I have seen thousands of dollars in removal quotes when a quick wipe was all it required. Sitting around the house and one day someone mentions mold or they have a mold inspector at their home. They get an idea that day to start inspecting for mold, they put up a website, get some cards made and presto..instant mold inspector. With the mold industry unregulated in Ontario anyone can become a mold inspector, no qualifications required. You can ask them for their qualifications, they can tell you they have them, how can you prove them wrong? You Can’t! Buyer beware. The Bottom Line, The bigger problem, there are lots of these companies out there scamming customers every day and right now. I didn’t really need this as a category but thought I’d touch on it by itself. Just because you have construction experience you are not a mold inspector. Just because you can inspect homes doesn’t make you a mold inspector. Just because you are handy around the house doesn’t make you a mold inspector. Just because you took a mold course you are not a mold inspector. Just because you have a degree in something doesn’t make you a mold inspector. Just because you can start a company and have cards printed doesn’t make you a mold inspector. I know companies out there that only have pieces of the puzzle and day in day out do great disservice to their customers because they are under educated and they feel the education they do have is correct and they don’t need any further advancement in their chosen field. The Bottom Line, research the company before allowing them into your home. This is where I get to toot my own horn. I didn’t get into this business just to make a buck, I wanted to do something that really excited me and gave me great satisfaction for a job well done. I love what I do and as such read as much as I can about the subject. I stay on top of current technologies but most of all I always do the right thing for my customers. I was in the construction field for twenty five plus years starting in the field as a labourer and working my way up and eventually into the office with various roles over the years including sales, purchasing, project coordination and project management. I knew when I turned fifty that I wanted to start another career and Home Inspection seemed like a logical step. I went to school and learned the ins and outs. Then the school offered a Mold Inspection course, during this course I knew I had found my calling and proceeded with my new career. I had the construction experience and lots of mold knowledge but no practical experience so I went and worked with a mold company. It was there I learned the good and the bad and the scams of this industry. Taking the good I opened my own Mold Inspection and Mold Removal Company in Toronto, serving all of GTA and Mississauga, and haven’t looked back since.